Rick Scott, the man who ran the nation's largest for-profit health company and who defrauded the government of millions, and who is now governor of Florida, has now turned his sights on health care in the state of Florida. Scott's actions are quite peculiar - everything he has done far could greatly benefit his family's business. Before Scott was elected, he signed over his company to his wife to give the appearance that there would be no future ethical dilemmas but that is far from the truth - his campaign was pretty much funded by accounts in his wife's name. Anyway, there are three things Scott has recently announced that he stands to profit from greatly - the privatization of Medicaid, the privatization of public hospitals, and drug testing of all public employees and welfare recipients. How exactly would Scott make money off of these proposals? Simple. He owns Solantic, a chain of urgent care clinics designed to attract those who do not have insurance, cannot get appointments with their primary care physicians, or do not have primary care physicians. The company specializes in urgent care services, immunizations, physicals, drug screenings, and care for injured workers. According to a Mother Jones article by Suzy Khimm, Scott has avoided answering any questions regarding conflicts of interest and pointed out that the program has failed in the past - Scott and his supporters still plan on going ahead. 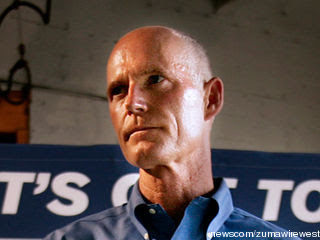 Florida Democrats have blasted the governor over the controversy. "These changes to Medicaid are basically nothing but a business plan for Rick Scott's Solantic," says Eric Jotkoff, a spokesman for the Florida Democratic Party. "It's clear that he stands to greatly profit from these changes to Medicaid." The Democrats also point to Scott's past: Columbia/HCA was ultimately forced to pay the biggest Medicare fraud settlement in history, totaling $1.7 billion, though Scott denied knowledge of the fraud and escaped being personally penalized. More recently, Florida's Medicaid system has also been beset by fraud perpetrated by private health care officials. In January, five former executives of Wellcare, a managed care company, were indicted by a grand jury for running a scheme that stole Medicaid money designated for patients. Scott's current proposal aims to save the state $1 billion by drastically overhauling Medicaid, allowing private managed care companies to bid for contracts rather than paying traditional fee-for-services. The majority of Medicaid patients receive care through private companies and HMOs, but under Florida's bill such firms would end up having vast new authority over the program, with great leeway to limit access to services or reduce benefits. The bill would also put a hard cap on the amount of money that these managed care companies could spend on Medicaid, which advocates say could particularly harm disabled and elderly patients who require costlier long-term care. In the past, Florida's Medicaid pilot programs—which tested the waters for the proposals at the heart of the current bill—have been plagued by problems. According to a 2008 study by the Georgetown Center for Children and Families, participants experienced huge delays and restricted access to necessary treatments, says the center's co-executive director, Joan Alker. Patients found the new system bureaucratic and confusing—and HMOs were prone to dropping out without warning. Dr. Aaron Elkin, president of the Broward County Medical Association, recently declared the program to be a failure. And Medicaid patients don't have much better reviews. "It has taken four months to get a biopsy on a throat cancer due to the impediments placed by the HMOs for authorizations," one participant in the program told NPR. Scott and Florida Republicans are nevertheless plowing ahead, arguing that slashing costs is necessary due to the state's $3.6 billion budget deficit. Yet even if the bill passes the Florida statehouse, it will likely face another roadblock with the Obama administration, which must approve the biggest changes in the measure. Though the Bush administration happily green-lighted the pilot program in 2005, Obama officials are less likely to be amenable to continuing the troubled program—much less expanding it. The Obama administration, however, is holding off from commenting on the Florida bill until it receives the final version, though officials are "aware of some of the concerns" raised about the pilot programs, says Mary Kahn, a spokesperson for the Center for Medicare and Medicaid Services. Changing Medicaid rules isn't the only way Scott would benefit - privatizing public hospitals is one way to get rid of the competition. One of Scotts first actions in the health industry was to invest in a couple hospitals and then purchase a nearby hospital only to close it down, thus increasing his clientele. Requiring state workers and welfare recipients to drug test is another way to increase business. Scott's walk-in clinics specialize in drug testing and care for the uninsured - it is a safe bet that most people on welfare or unemployment lack health insurance of any kind, meaning they would depend on companies like Scott's. Scott also believes drug testing will save the state money, but past results have found it to be extremely costly for the state, yielding to few benefits, and lets not talk about the constitutionality of it all - I'll leave off by stating a judge had ruled the practice of drug testing state employees to be a violation of their rights, but Scott has really shown no interesting in upholding existing laws. Basically, Scott is passing legislation that appears to benefit the state but in reality stand to benefit himself, which is why he refuses to talk about any conflicts of interest. It is also smart of him to pass this stuff early in his term and all at once, that way when it is time for reelection the stupid voters won't remember Scott funneled tax payer dollars into his his wife's business.